A regional digital boss who served as president of the Society of Editors in 2015-16 has been made redundant from his role. Nick Turner, left, has left the Carlisle-based CN Group after his role of digital strategy chief was axed. The move comes just months after Nick hosted the SoE’s annual conference in Carlisle in his role as president. The CN Group, publisher of the News & Star, Carlisle and the North West Evening Mail, is now looking to appoint a group digital commercial director to oversee all its digital operations. Nick, who had worked for the CN Group for the past 25 years, is also organiser of the Digital Editors’ Network which brings together digital managers from the regional and national media. 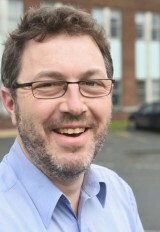 His departure was announced in a message to staff by group development director Jonathan Lee on Friday. It read: “I wanted to let you all know of changes to our digital operation. We will be appointing a senior group wide digital director to lead one CN Digital operation and ensure we maximise the opportunities for our business. “Our existing digital teams, who have been reporting to Stuart Cooke and Nick Turner, are forming one CN Digital team. Unfortunately Nick Turner’s role as digital strategy manager has been made redundant and Nick has left the business. “The digital team who reported to Nick will report to Stuart until we announce the appointment of a group digital commercial director. Nick added: “Obviously I am very sad to be leaving CN Group after 25 years, but am seeing this as a positive opportunity to take a fresh look at my career. One would sssume he would have known about,and been part of the process of their future digital strategy if hos role was that of digital strategy chief? Redundant? I understood that they couldn’t make you redundant unless you genuinely were redundant. CN group sound to me as though they are replacing like with like (only much cheaper, of course). A pedant writes: It’s the job that’s made redundant, not the person, though I know that this can amount to the same thing.